The Case IH Module ExpressTM cotton harvester picks cotton at maximum efficiency and simultaneously builds ginner-friendly cotton modules - dramatically reducing your equipment and labor investment while streamlining the harvest process. The module monitor provides operation status and percent full. In the majority of field length and yield possibilities, the Module Express 635 will be on a field end when the module is between 90 and 125 percent of normal size and ready to unload. This minimizes handling of the modules — the module truck picks up the module right where it is unloaded. A 7 in (18 cm), flat-screen, color LCD video monitor provides two camera views — in the module chamber and a rear view behind the machine. 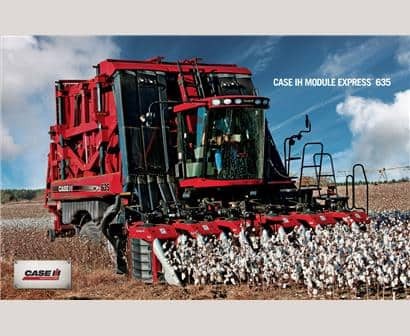 Case IH engineers paid special attention to balance, weight distribution and floatation when designing the Module Express pickers to keep ground pressure low. 500/95–32 R1.5 dual-drive tires are used up front for high flotation, with large 23.5–26 steering tires on the powered rear axle. A longer chassis also contributes to balance, and combined with the powerful engine, a three-speed hydrostatic transmission and all-wheel-drive, the Module Express 625 can harvest in difficult conditions as easily as it does on dry ground. Along with the high-flotation dual tires, these design features make the Module Express 625 one brawny performer that's remarkably light on its feet. With its 200 gal. (757 L) fuel tank, 365 gal. (1,381 L) water solution tank and an 80 gal. (303 L) bar lube tank, the Module Express 625 can pick all day on just one fill-up. And its standard automatic lube system runs for 16 minutes every fan hour — saving an hour from your daily service routine. Metered lubrication to drum gears, cam tracks, rollers, drum lift arms and fan bearings provides reliability of components and delivers a metered amount of grease to each component automatically. For all its advanced features and enhanced productivity, the Module Express 625 actually requires less daily maintenance than a traditional basket picker. The two-function service tether allows the operator to easily perform service at ground level. No need for hand cranks – the Module Express 625 features a simple, hydraulic drum-spread providing full access to the two-sided drums or drum rotation at the touch of a button. And Case IH engineers added on-board module building functionality without requiring any additional service needs. See your dealer about 0% financing options.